"Kiss, Destroyer - OBI Box Set (10 CDs)"
KISS - DESTROYER - Japanese OBI MINI REPLICA LP TITLES making a 10 CD Box Set- Japanese OBI MINI REPLICA BOX SET Japanese re-mastered Mini LP replica Limited Edition Collection Recorded from the finest Original Masters available. Each title Comes with anti-static sleeves similar to Vinyl LPs, Cardboard packaging exact to the original LP, Re-sealable plastic wrap cases for protection of each collectible Actual miniaturized version of the 12" LP in 4" CD version Special VERY RARE LIMITED EDITION BOX SET ONLY PRODUCED ON FUTURES FOR THIS ONE TIME PRESSING -- were only available in Japan. 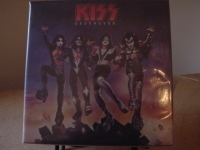 REPLICA LP IN A CD BOX SET INCLUDES - KISS - SELF TITLED - Track Listings 1. Strutter 2. Nothin' to Lose 3. Firehouse 4. Cold Gin 5. Let Me Know 6. Kissin' Time 7. Deuce 8. Love Theme from Kiss 9. 100,000 Years 10. Black Diamond HOTTER THAN HELL - Track Listings 1. Got to Choose 2. Parasite 3. Goin' Blind 4. Hotter Than Hell 5. Let Me Go, Rock 'n' Roll 6. All the Way 7. Watchin' You 8. Mainline 9. Comin' Home 10. Strange Ways DRESSED TO KILL - Track Listings 1. Room Service 2. Two Timer 3. Ladies in Waiting 4. Getaway 5. Rock Bottom 6. C'mon and Love Me 7. Anything for My Baby 8. She 9. Love Her All I Can 10. Rock and Roll All Nite ALIVE! - Track Listings Disc: 1 1. Deuce 2. Strutter 3. Got to Choose 4. Hotter Than Hell 5. Firehouse 6. Nothin' to Lose 7. C'mon and Love Me 8. Parasite 9. She Disc: 2 1. Watchin' You 2. 100,000 Years 3. Black Diamond 4. Rock Bottom 5. Cold Gin 6. Rock and Roll All Nite 7. Let Me Go, Rock 'N' Roll DESTROYER - Track Listings 1. Detroit Rock City 2. King of the Night Time World 3. God of Thunder 4. Great Expectations 5. Flaming Youth 6. Sweet Pain 7. Shout It Out Loud 8. Beth 9. Do You Love Me ROCK AND ROLL OVER - Track Listings 1. I Want You 2. Take Me 3. Calling Dr. Love 4. Ladies Room 5. Baby Driver 6. Love 'Em and Leave 'Em 7. Mr. Speed 8. See You in Your Dreams 9. Hard Luck Woman 10. Makin' Love LOVE GUN - Track Listings 1. I Stole Your Love 2. Christine Sixteen 3. Got Love for Sale 4. Shock Me 5. Tomorrow and Tonight 6. Love Gun 7. Hooligan 8. Almost Human 9. Plaster Caster 10. Then She Kissed Me ALIVE II - Track Listings Disc: 1 1. Detroit Rock City 2. King of the Night Time World 3. Ladies Room 4. Makin' Love 5. Love Gun 6. Calling Dr. Love 7. Christine Sixteen 8. Shock Me 9. Hard Luck Woman 10. Tomorrow and Tonight Disc: 2 1. I Stole Your Love 2. Beth 3. God of Thunder 4. I Want You 5. Shout It Out Loud 6. All-American Man 7. Rockin' in the USA 8. Larger Than Life 9. Rocket Ride 10. Any Way You Want It DOUBLE PLATINUM - Track Listings 1. Strutter '78 2. Do You Love Me? 3. Hard Luck Woman 4. Calling Dr. Love 5. Let Me Go, Rock 'N' Roll 6. Love Gun 7. God of Thunder 8. Firehouse 9. Hotter Than Hell 10. I Want You 11. Deuce 12. 100,000 Years 13. Detroit Rock City 14. Rock Bottom (Intro)/She 15. Rock and Roll All Nite 16. Beth 17. Makin' Love 18. C'mon and Love Me 19. Cold Gin 20. Black Diamond DYNASTY - Track Listings 1. I Was Made for Lovin' You 2. 2000 Man 3. Sure Know Something 4. Dirty Livin' 5. Charisma 6. Magic Touch 7. Hard Times 8. X-Ray Eyes 9. Save Your Love These are Japanese digitally re-mastered Mini LP replica CDs (the OBI Edition). This Limited Edition Collection has only VERY FEW made world-wide and are immediately Out of Print. Recorded from the finest Original Masters available. Comes with anti-static sleeves similar to Vinyl LPs, Cardboard packaging like an LP. Actual miniaturized version of the 12inch LP in 4inch CD version.